It is the policy of the Trustees of the California State University that to the maximum extent feasible by present earthquake engineering practice to acquire, build, maintain, and rehabilitate buildings and other facilities that provide an acceptable level of earthquake safety for students, employees, and the public who occupy these buildings and other facilities at all locations where University operations and activities occur. 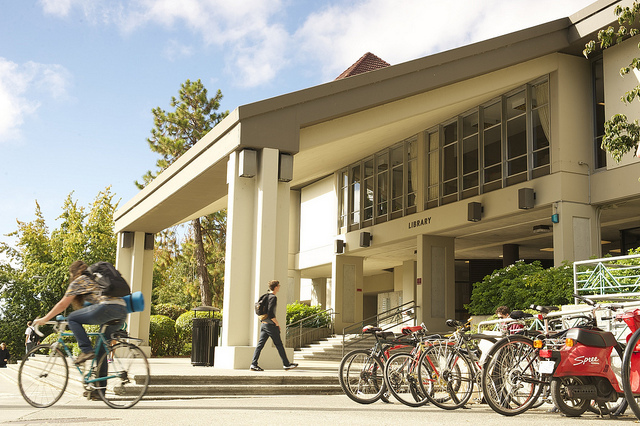 The California State University Seismic Review Board classified Humboldt State University’s Library as a Priority One Seismic Retrofit Project. CSU Priority List One identifies facilities that warrant urgent attention for seismic upgrade as soon as resources can be made available. The Library Seismic Retrofit Project is a series of crucial updates that provides timely opportunities for much needed renovations. With support and funding, here is what to expect of your library in the coming years. The HSU Library Seismic Retrofit Project began construction in April 2016. During this retrofit, the library will undergo extensive structural improvements and repairs. The scale and scope of this renovation provides an important opportunity to ensure that the physical space of the Library is configured to best meet the needs and goals of HSU students, faculty, and staff. To that end, many Student Centered Spaces will be built or renovated during the seismic retrofit renovations. For questions, please contact Michael Fisher, Associate Director of Planning & Design at Facilities Management. The construction period for Phase III will be September 2018-August 2019, with the majority of the heavy concrete work being conducted in the summer months. Additionally, there will be interior work that includes the final book stack retrofit, minor suspended ceiling seismic improvements, and ADA required modifications. Consolidate microfiche on 2nd floor. Relocate the Media, Microform, and Children's Literature Collections. Enlarge the Helen Everett Reading Room to accommodate another event space like the Fishbowl. Turn the Humboldt Room into an experimental classroom. Program to renovate basement to be developed Fall/Spring 2018, with construction in 2019. The exterior seismic upgrades relative to exterior concrete columns, replacement of exterior lighting with LED fixtures, and improving the building entry gates and accessible pathways, will be implemented starting fall of 2018. Seismic land coefficient code changes necessitated construction design changes that delayed construction until 2018. See PHASE III below. The Project will replace the tile roof and paint the exterior of the building. Additionally, there will be limited interior work that includes moving interior book stacks on the first, second, and third floors of the building. During the construction period, both the main entries to the basement and the first floor will remain open and accessible. The exterior walkways under the exterior canopies at the basement level and the first floor level will be within the construction zone and will not have public access. Additionally, the library parking lot will be impacted for contractor laydown space. A detailed detour and parking lot map will be published. There will be periods of noise related to demolition of roof. Also there will be scaffolding and large equipment moving around the building. See the detailed detour and parking lot map for more information. See the detailed detour and parking lot map for more information. The HSU Library does not plan to close during various phases of this project. We are committed to learning, research, scholarship, and community. The opportunity to invest in students and knowledge at the HSU Library is open. If you are interested in hearing more about the HSU Library Seismic Retrofit Project, or supporting the Digital Media Lab, Humboldt Scholars Lab, Special Collections renovation, or the Center for Teaching & Learning, please contact the Library Dean, Cyril Oberlander.